Back in the 80’s, the future was so bright, you gotta wear shades. 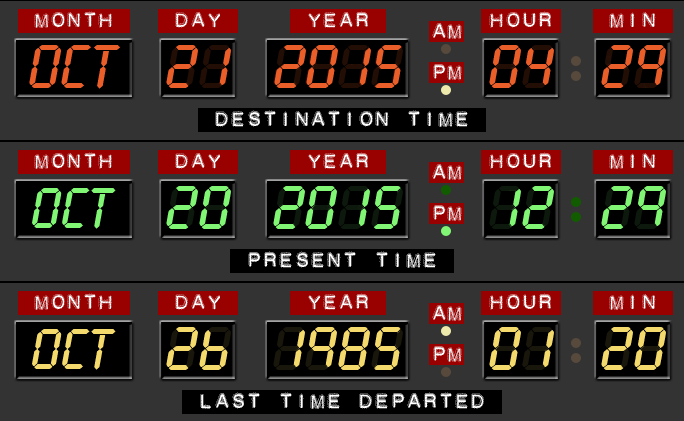 As you’ve doubtlessly have heard by now, October 21, 2015 is the furthest date destination Back To The Future protagonists Doc Brown and Marty McFly made in the DeLorean . Of course, the present day looks almost nothing like Back To The Future director Robert Zemeckis and screenwriter Bob Gale envisioned. We still don’t have flying cars for one, and he completely missed the boat on the internet being such a big deal. College Humor (remember them?) might not be at the forefront of the internet the way they used to be, but they still pump out a lot of solid, original content. And this is what’s important. Few things are more harmful to entrepreneurship the human spirit than a lack of imagination. A future that’s no fun to imagine is a future not worth thinking about. The filmmakers did get a few things right though. This recent Toyota ad (which we wish we were paid for sharing, but them’s the breaks) reunited Michael J. Fox and Christopher Lloyd and had them musing about what things the Back To The Future series did get right. The series continues to hold a firm status not just as a film classic, but as the standard by which time travel films are judged. Over the past three decades, it continues to inspire fresh perspectives about how things can be. Of course, things haven’t been so bad for Universal Pictures, which has earned just shy of a billion dollars from the original trilogy as of the end of its box office run in 1990 (approx. $965.5 million) and millions more from product endorsements, theme park rides, merchandise, and numerous spin-offs. Not to mention yet another DVD release. What do you want to see in your future? Comment below!